In the image below you can see Acorn's canvas. This is where the composite of all your layers are viewed and where you draw, crop, or modify your image in other ways. The bottom portion of the canvas window is called the status bar. On the bottom left hand side of the window along the status bar you can find the image size. Clicking on the image size label will toggle it between the image size, and the image PPI (Pixels Per Inch). If you have a selection present, this is where you can find its width, height, and x,y coordinates. The current zoom (or magnification) level, as well as the option to change the zoom using a slider can be found on the bottom right hand side of the window's status bar. To manually enter a specific zoom value, click on the number percentage and an editable field will appear. The file name and format can be found along the center of the top window bar, and the close, minimize, full screen buttons are at the top left. Going into full screen mode allows you to expand Acorn to the entire screen. Toggle between regular screen and full screen mode quickly by using keyboard shortcut 'f'. To hide or display the tools palette in full screen mode, toggle the tab key. 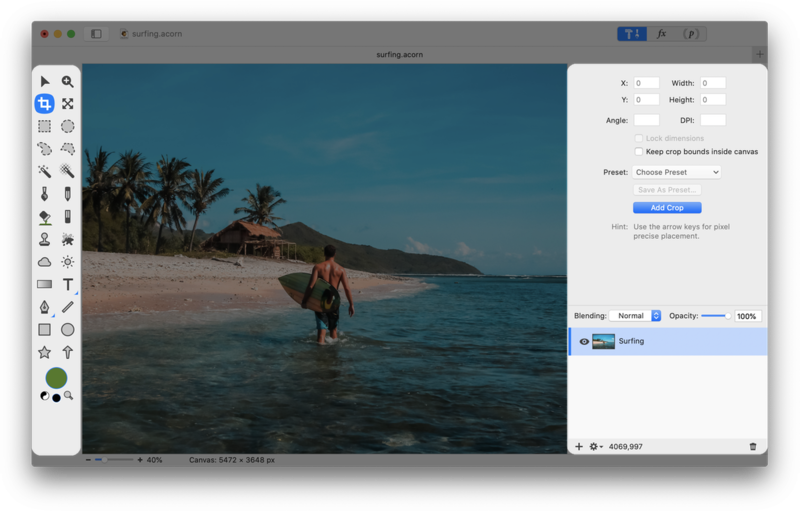 Move the canvas anywhere in the screen using the pan tool (quick tip- hold down the space bar while using the move tool as an additional way to position the canvas). Acorn's various tools are available in the tools palette. When a tool is selected, its options are presented in the inspector palette. 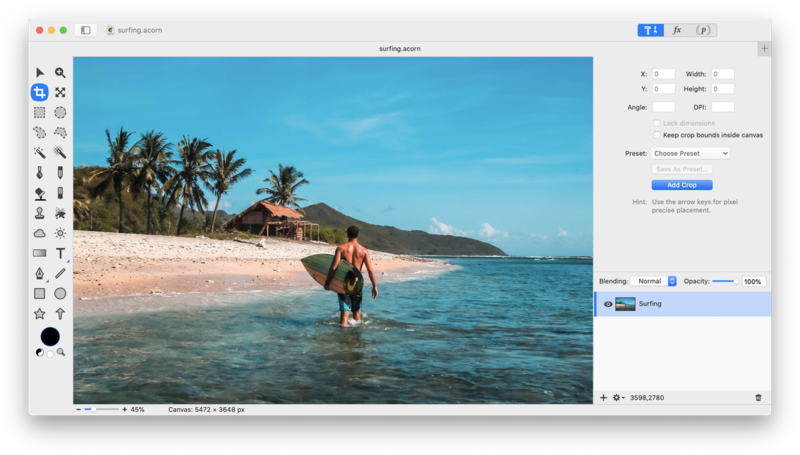 In this case, the crop tool is chosen and the inspector palette gives you the option to modify its size, angle, position, as well as other variables. To hide or display the tools palette or inspector palette, choose Window ▸ Tools or Window ▸ Inspector. Located at the bottom left hand corner of the inspector palette are 3 buttons. The '+' button adds a new layer to your image. The 'fx' button brings up the filter window where you can search and choose from the various filters Acorn offers. Clicking on the cogwheel allows you to bring up the layer contextual menu where you can add, delete, duplicate, and perform many other tasks with your layer. Clicking on the trash can located in the bottom right hand corner with delete the currently selected layer. The layers list contains a list of all your layers. 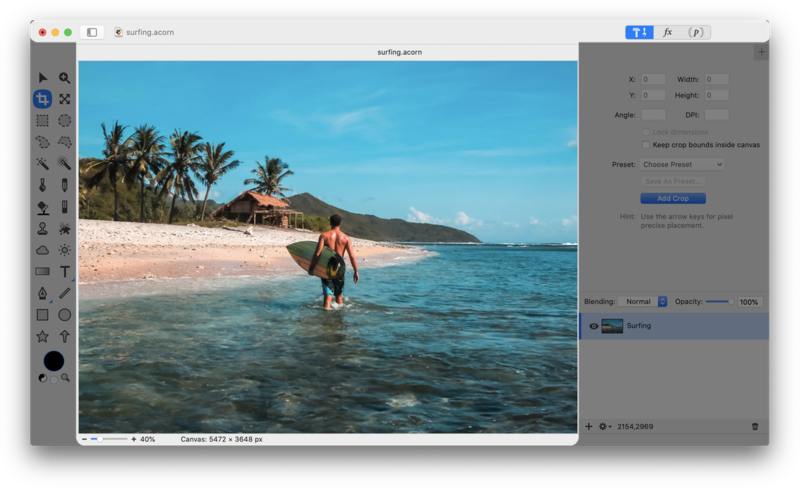 Layers are composited together to form a single image which shows up in your canvas. The layers list is located at the bottom of the inspector palette. 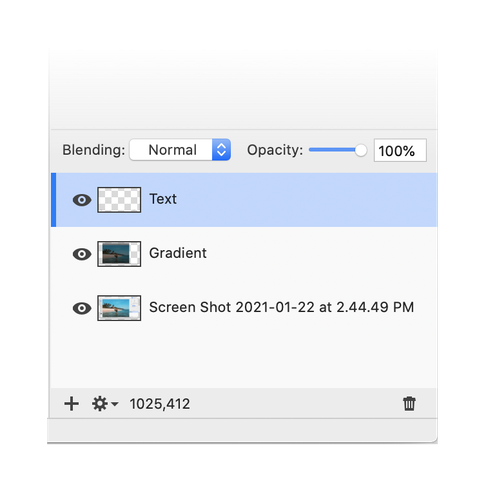 Also, notice a drop down menu for the blending modes, as well as a slider for the opacity of the selected layer. A lot more information on this topic is available at Layers Basics. The menu bar is located across the top of your screen. It allows you to access the various options available within Acorn such as saving your image, copying and pasting, and viewing guides. When you click and hover over a menu item a drop down menu will appear giving you more choices. For a full list of Acorn’s menu options, click here.